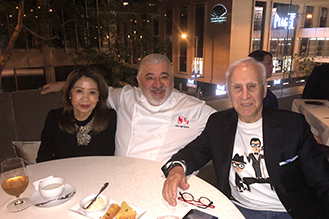 Helen Ching-Kircher and Dr. Peter A. Kircher had the pleasure to meet with Umberto Bombana – world famous Chef at his restaurant 8½ Otto e Mezzo Bombana. The restaurant’s name is a tribute to Bombana’s favorite Italian film director Federico Fellini’s 1963 autobiographical movie 8½. The movie won Academy Awards for Best Foreign Language Film and Best Costume Design.